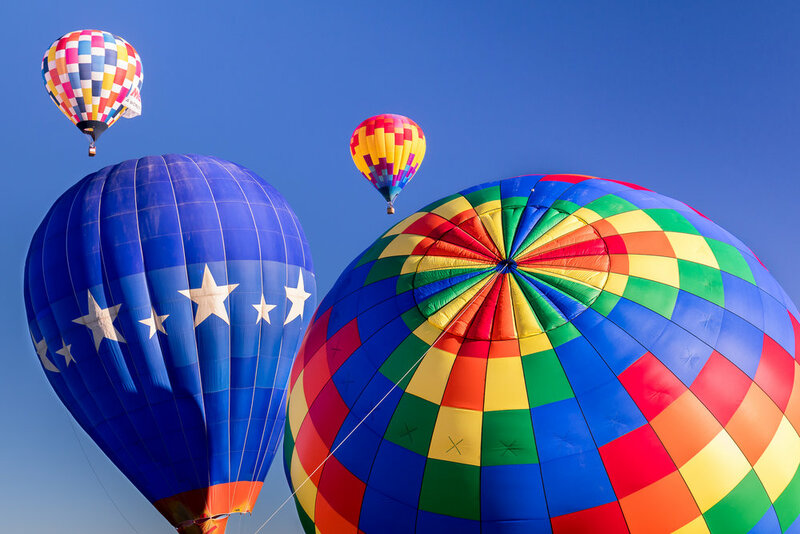 Every year Albuquerque hosts it’s iconic International Balloon Fiesta. The event draws hundreds of balloons and hundreds of thousands of spectators. It is advertised as the most photographed event in the world. This article focuses on my advice for photographing the event and coming away with unique and memorable images that stand out from the millions of other captured moments. Balloon Fiesta can be a beautiful and awe-inspiring event. However, the experience requires planning, dedication, and a substantial amount of patience. Otherwise, it may turn into a disappointing headache. The convention starts on a Saturday and runs 9 days until the following weekend. 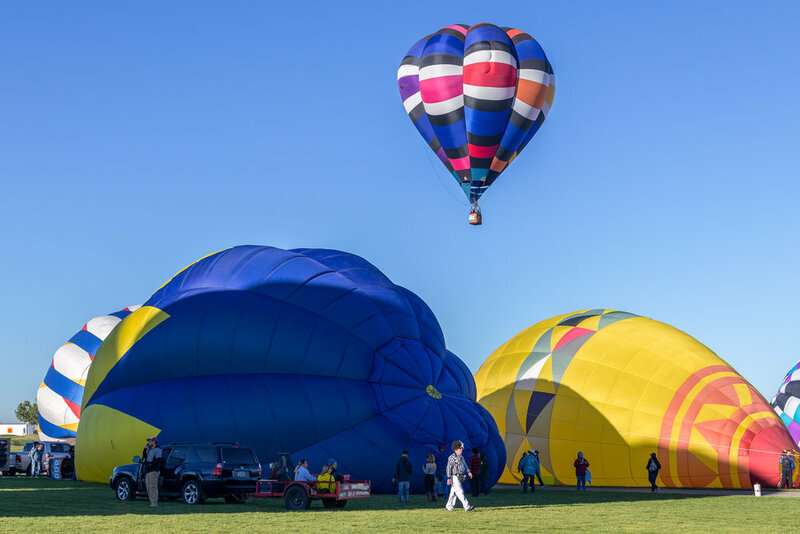 Balloon Fiesta has many individual events which run throughout this time period. The exact schedules vary by day but the Saturday/Sunday lineups seem to generally be the same. The most famous and popular productions of Balloon Fiesta are the 7 AM Mass Ascensions. During Mass Ascension, hundreds of balloons take off from the field in waves over a period of several hours. This event is what most people come to see. The other morning event of interest to photographers occurs even earlier at around 6 AM. 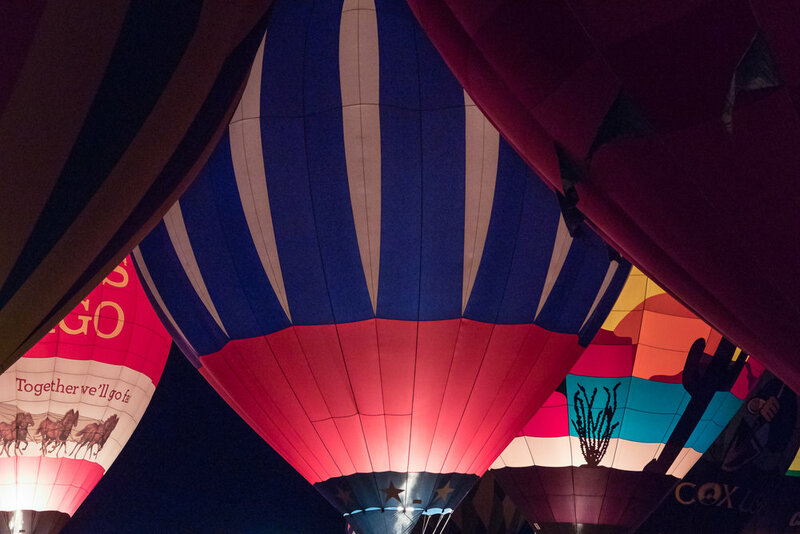 During this event, known as Dawn Patrol, a dozen or so balloonists inflate their balloons and take off before the sun rises. During Mass Ascension, hundreds of balloons take to the skies. The traffic surrounding Balloon Fiesta Park effectively shuts down the interstate and other nearby roads. I have heard numerous horror stories about trying to park at the field. I wouldn’t try to park at Balloon Fiesta Park unless I intended to arrive before 4:30 AM. I instead purchase a park-and-ride ticket. This let’s you park in one of several large parking lots around the city and take a school bus to the park. Several roads surrounding Balloon Fiesta are reserved exclusively for these buses. However, even with this approach you may still end up stopped in traffic for over an hour. This year I got to the park-and-ride lot at 5 AM and was at Balloon Fiesta by 5:45. This gave me a few minutes to prepare for Dawn Patrol. However, the line to get on the bus and the length of the bus ride get longer and longer as the morning drags on. My advice is to get to the park-and-ride location before 5:30 AM if you don’t want to risk being late for mass ascension. Balloon Fiesta also offers a bike valet service. This may be the ideal way to get to Balloon Fiesta though I haven’t personally done this. During Dawn Patrol, a small number of balloons inflate and take off early in the morning before everyone else. These balloons appear like floating Chinese lanterns in the sky. Mass Ascension starts at 7 AM. During the first hour, waves of balloons take the skies in densely packed waves. Between 8 - 9 AM, the frenzy gradually abates to more of a trickle. After 9 AM there are still balloons taking off but the field is much more sparsely populated. By 9:30 AM many people are ready to go back home or to their hotels and take a nap. If you use the park-and-ride, expect to wait up to an hour in line to get on a return bus at 9:30 AM. No balloons take off in the evening as it’s not safe to land in the dark. In lieu of this, several programs are offered that take advantage of the darkness. For photographers, the primary events of interest are the Balloon Glows. During an evening Balloon Glow, dozens or maybe even hundreds of balloons inflate enough to take shape but not enough to take flight. The balloonists add propane occasionally to keep their balloons inflated. When they add fuel, the balloons light up like lanterns. Most of the time the balloons are pulsing on their own schedule, independently of one other. Occasionally, however, the MC counts down from 10 and all the balloons light up at the same time. This creates a dazzling and colorful display of lights underneath the dark night sky. The night Balloon Glow is not as busy as the morning Mass Ascension. I have successfully parked at Balloon Fiesta Park at night for this event. However, you should still expect significant traffic delays. The evening park-and-ride is still a good option. Albuquerque is in a desert. Although it may be warm during the day, October night temperatures can be in the early 40s or upper 30s Fahrenheit. Bring layers of clothes, jackets, and gloves. The elevation of the park is nearly 1 mile and it’s easier to get sunburned than at lower elevations. Wear sunscreen and bring a wide-brimmed hat to keep the highly directional sun off your eyes. For shooting Dawn Patrol and Balloon Glows, it’s helpful to have a headlamp for finding and setting up gear. Finally, although there are numerous vendors, bring your own food and water to avoid the lines and inflated food prices. If possible I would recommend bringing two bodies: one with a wide zoom and one with a telephoto zoom. I only have one body and found myself switching lenses constantly. Although I am generally a heavy tripod user I don’t recommend bringing a tripod unless you have a special use case. Mass Ascension is a highly dynamic, even chaotic environment. There’s no time to fiddle with a tripod. Even if there were, once the sun comes out over the mountain there is plenty of light to handhold at low or even base ISOs. I was sure I would use a tripod at the balloon glows but quickly found a problem: the balloons are not static. Even at the evening balloon glow, where the balloons don’t take off, they sway in the wind so much that low shutter speeds below 1/20s are impractical. If you do the park-and-ride, you may also face the prospect of carrying the tripod around while waiting in long lines. Another thing I would avoid, or at least use with caution, is a polarizer. I almost always shoot outside with a polarizer. However, when shooting Balloon Fiesta with a polarizer I got really significant banding in many photographs. The early morning sky naturally has a lot of gradients. However, the polarizer enhanced these to a ridiculous level and for some photographs I spent a significant amount of time “de-banding” the sky in Lightroom. Using a polarizer created an extreme gradient in the sky. I used various gradient tools in Lightroom to try and restore the sky to it's actual luminostiry. Mass Ascension is beautiful, big, surreal, overwhelming. I imagine that everyone comes away with their own unique experiences and highlights. Here is what I find most compelling. The real magic of Balloon Fiesta starts around 7:30 AM when the sun starts peeking over the Sandia Mountains. The sun breathes life into the balloons, revealing their vibrant colors and in some cases turning them into giant lanterns. I love finding ways to use the golden, highly directional light coming in from the east. 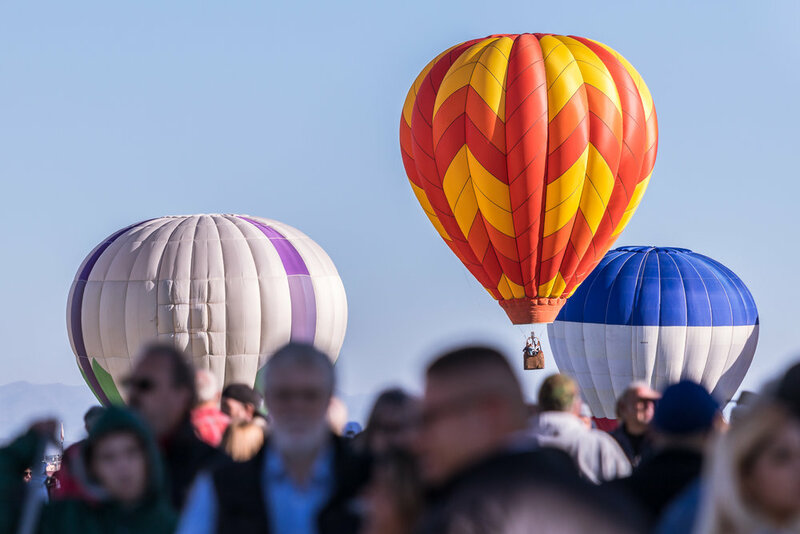 Many things about Balloon Fiesta are larger than life: the balloons, the sky, the crowds. I try to give a sense of this scale in some of my photographs. To achieve this you can shoot wide to include a large expanse of the field and sky. For wide shots, it can be difficult to get a clean foreground without distracting elements (like people). Some areas of the park are less crowded than others (it seems to me that the north end is less packed). Alternatively, shooting telephoto can compress depth in interesting ways. I think wide angle shots tend to “shrink” the balloons relative to people and cars in the foreground. Some of these balloons are huge — larger than multistory houses. Including the crowds among the inflating balloons at telephoto focal lengths can help the viewer understand the size of these airships. 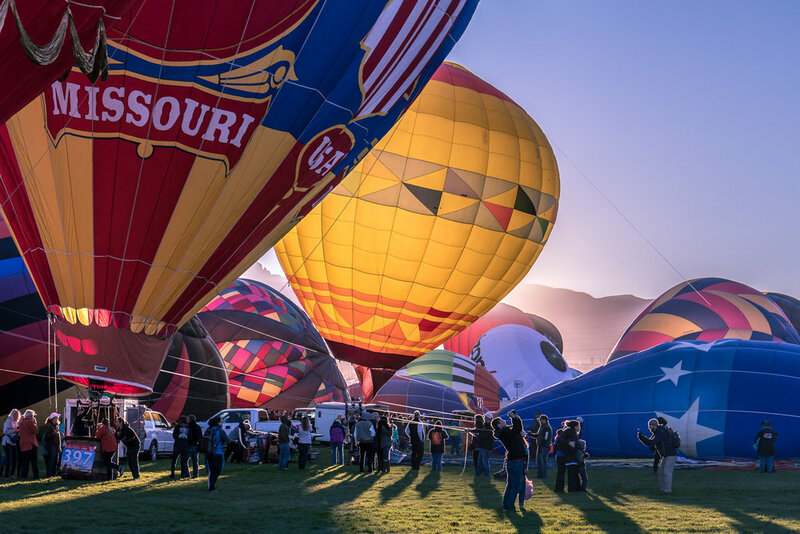 The epic scale of Balloon Fiesta is a fusion of many constituent pieces and details. I like focusing on individual balloons. There are so many creative ones — particularly the “special shapes” which depict animals, movie characters, and much more. I also try and photograph the people — including the visitors, balloonists, and “zebra” referees — who infuse the field with so much energy. Finally, it’s fun to build nearly abstract compositions out of the cacophony of shapes and colors. Shooting this spectacle outside of Balloon Fiesta Park offers a different perspective on the events. 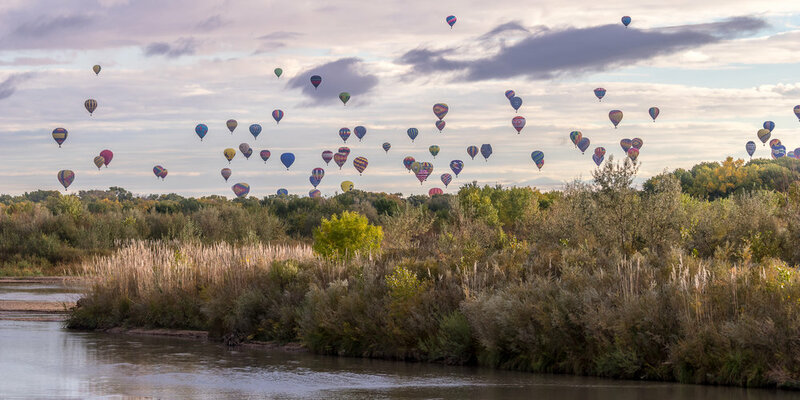 These locations can showcase natural and urban features that the balloons fly over in the Albuquerque area. However, there is some risk in attempting to photograph outside of the balloon field since there is no way to know exactly where the balloons are going to fly. This year I shot Dawn Patrol and Mass Ascension off of a pedestrian bridge on Alemeda road. This is potentially a great viewing location if the balloons fly due west. During my photo shoot, however, they flew more northwest and I missed out on close views. 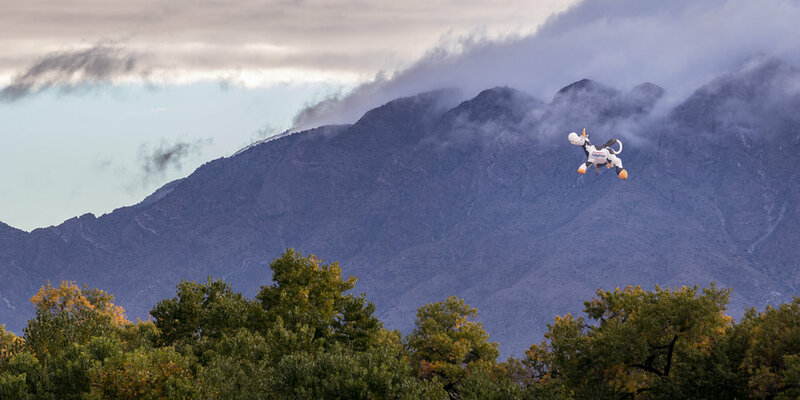 Though I got some intriguing telephoto compositions, including some epic clouds atop the Sandia mountains, I would have been more excited about these shots if the sun had popped out of the clouds and more directly illuminated the floating balloons. Regardless, I definitely got some unique shots that are very different from those I have captured at Balloon Fiesta Park. Dawn Patrol and the Balloon Glows are rather difficult events to shoot. The primary light sources (the balloons) flicker on and off. The ambient light is low. The balloons sway in the wind, grow while inflating, and may eventually take off (for Dawn Patrol, not for the evening glows). My first idea for photographing these events was to use a tripod. However, I had mixed results with this. The balloon motion means that slow shutter speeds result in blurry subjects. I got some sharp, though not tack sharp, images as slow as 1/20 second. The minimum allowable shutter speed is going to depend on balloon motion, focal length, and your personal tolerance for motion blur vs high ISO detail loss. I personally was most comfortable with 1/100 second. At these shutter speeds, with an image stabilized wide angle zoom, a tripod becomes rather unnecessary. As I have written about in a previous post, there is a short window where artificial lights balance perfectly with the twilight sky. During this period the orange flames illuminate the balloons against a dark blue sky and I shot fairly wide to include the sky and take advantage of this effect. After the sky faded to black, I focused more on filling the frame with individual or groups of balloons. 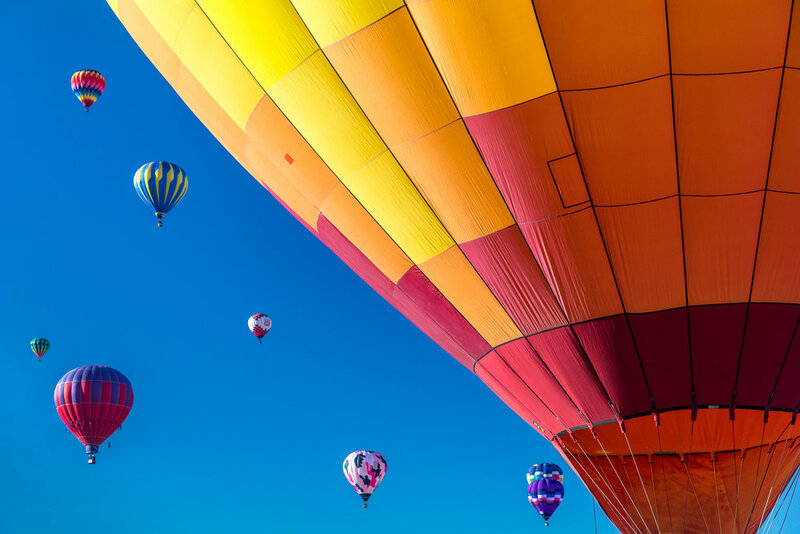 Balloon Fiesta is a breathtaking experience with proper planning. There is an endless variety of photography opportunities including many that I haven’t yet experienced (including, notably, shooting the event from a hot air balloon). I hope this article inspires you to attend next year and see it through your own unique lens.